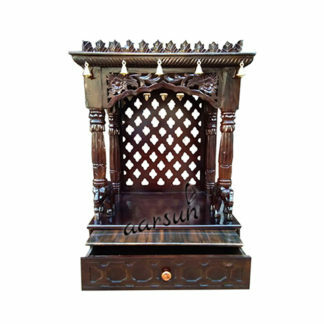 Temples/puja ghar is one of the important part of every home.You can feel peace and power of that almighty whenever you worship.To give more importance to your almighty Aarsun woods present to you the elegantly crafted wooden temple made up of fine quality Teak wood.The temple is beautifully crafted by our skilled artisans and best suitable for the home and for the offices. At the top of the top of the roof there is peacock mehraab area at the front of the along with finials at the corner of the roof.Below that there is main place of the deity in closed set.At the front of the temple there are beautifully carved elephant placed in welcome manner.there is wooden jaali design carved at the doors of the temple along with brass handle.Below that there is sliding tray for lighten up diya,incense sticks and deity pedestal.Below that there are wooden drawers for placing small puja essentials like match sticks,incense sticks,rose water holy books etc.There is brass handle placed at the drawers and there are beautiful carving done over at the drawers.The temple is mounted on curve foots and it give very elegant and sophisticated look to the your home. 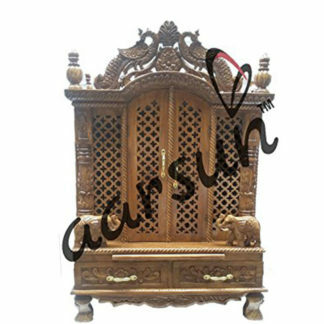 The temple is best suitable for your home and for your offices and it can add more traditional look to your home.As we are the manufacturers so customization are available as per the requirement of the customer. 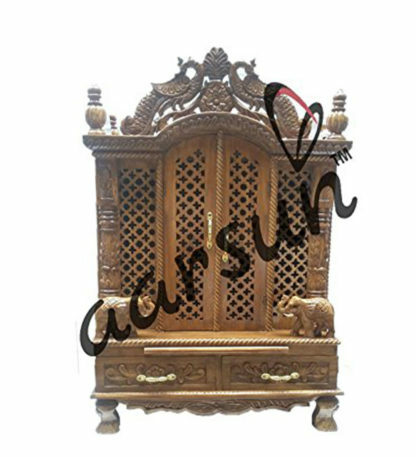 We provide free shipping across India.